Combat signs of premature aging with the Caudalie Premier Cru Eye Exclusive Bundle; combining the award-winning Premier Cru Eye Cream and a brightening serum. 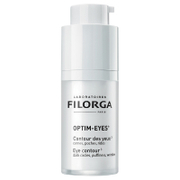 Eyes appear lifted and revitalized with a youthful looking glow. Specially formulated for the most sensitive part of your face, this luxurious cream is formulated with three Caudalie patents and the most in-depth anti-aging research. 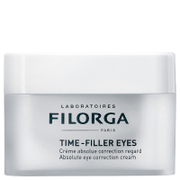 This wonder cream improves and corrects the look of dark circles, wrinkles, puffiness and dullness, leaving your eye area appearing younger and brighter. Silver, copper and iridescent pearlisers visibly reduce the appearance of dark circles to give the illusion of bright and radiant skin. This satin-soft, lightweight serum works to correct and prevent the appearance of dark spots, helping to even out skin tone and renew radiance. It delivers a concentrated dose of patented Viniferine and antioxidants, which help to counter sunspots, acne marks, scars and sun damage, revealing a brighter and refined complexion. 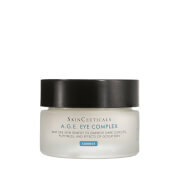 Eye Cream: Aqua (Water), Butylene Glycol, Cetearyl Alcohol*, Ethylhexyl Stearate*, Cyclopentasiloxane, Glycerin*, Triisostearin*, Polymethyl Methacrylate, Bis-Behenyl/Isostearyl/Phytosteryl Dimer Dilinoleyl Dimer Dilinoleate*, Peg-20 Stearate, Imperata Cylindrica Root Extract*, Ci 77891 (Titanium Dioxide), Ci 77019 (Mica), Hydrogenated Avocado Oil*, Hydrogenated Olive Oil Stearyl Esters*, Silica, Tocopheryl Acetate*, Vitis Vinifera (Grape) Seed Oil*, Palmitoyl Grape Seed Extract*, Hydrolyzed Hibiscus Esculentus Extract*, Dextrin*, Caffeine*, Benzyl Alcohol, Palmitoyl Grapevine Shoot Extract*, Caprylyl Glycol, Coffea Arabica (Coffee) Seed Extract*, Carbomer, Xanthan Gum, Tocopherol*, Lecithin*, Hyaluronic Acid, Dehydroacetic Acid, Sodium Hydroxide, Polysorbate 20, Sodium Carboxymethyl Beta-Glucan, Acetyl Tetrapeptide-5, Tin Oxide, Ci 77491 (Iron Oxides), Acrylates/C10-30 Alkyl Acrylate Crosspolymer, Palmitoyl Tripeptide-1, Palmitoyl Tetrapeptide-7. (116/183). Serum: Aqua (Water), Butylene Glycol, Glycerin*, Squalane*, Tocopheryl Acetate*, Ceteareth-20, Palmitoyl Grapevine Shoot Extract*, Glyceryl Stearate Se *, Bisabolol*, Parfum (Fragrance), Caprylyl Glycol, Acrylates/C10-30 Alkyl Acrylate Crosspolymer, Potassium Sorbate, Xanthan Gum, Carbomer, Sodium Hydroxide, Sodium Phytate*. * Plant Origin.